We FINALLY gave Choon Ean her birthday pressie... after a wild goose hunt across the world, literally. I kid you not. 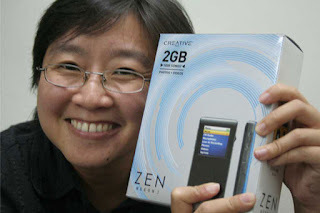 It all started with Poh finding out that Choon Ean was on the lookout for a new mp3 player... specifically - Creative and 2GB. We thought "Hey, since her birthday's just around the corner... why not?" That was the goose that began our hunt. Sis calls from S'pore and says NOBODY stocks that model and who on earth buys Creative anyway? Then offers to get Jo Dee to buy an iShuffle while he's in New York. Ok, not a bad idea. Then Poh says PC fair is on during Easter weekend. Try there. OK! Choon Ean comes up for Easter, pops by and sees the ZEN model she wants on Sat... but still needs to consider... while Poh prays like mad that she will decide NOT to buy it so we can go back later and buy it. Thank God Choon Ean decides No - we still have hope. But no one else is going to the PC Fair on Sunday so cannot tumpang beli, Poh can't shake Choon Ean off to sneak away to get the merchandise and I've gotta get my sis to the airport! Apparently Peter is working at PC Fair - he can't get it 'cos they can't sell it to other exhibitors. Arrgghh!!! So near yet so far!!! Nevermind, there's still dinner on Mon night and Peter said the distributor is in Gurney. Perfect! Dinner at Food Loft and I can sneak off to buy. Guess what?! DON'T HAVE!!! Can you believe that?! They have everything except what we're looking for. Great... we're all at dinner with a cake to celebrate and NO mp3 player!!! We admit defeat. I guess God saw the desire of our hearts... Poh happened to walk past a shop in Midlands and saw the same flyers as the one in the PC Fair! Lo and behold... There lay before her the ZEN that Choon Ean was eye-ing at the PC Fair!!! Thank you GOD!!! It's blue but Poh grabs it anyway... Yay!!! 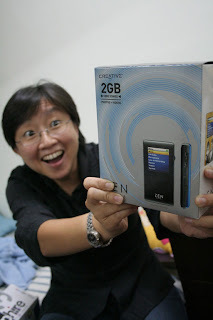 So here's Choon Ean... finally receiving her birthday pressie in KL. Even that - it was good timing that Poh was going down to KL to edit stuff with her. With much love from from Junie, Jocelyn, Poh and me. Thank you so much all four of you, not just for the gift but for your friendship and care that you've shown me this last couple of years. That, just like the story above, has made the gift even more meaningful. =) Oh - and thank you as well to everyone who took part in one way or another in the wild goose chase!